When you are in a relationship, you know that the behaviors that each person exhibits plays a critical role in the overall strength and happiness of the relationship. Defensive behavior is one that can lead to issues because it is a negative behavior. You need to understand what this behavior is and how it impacts all of your relationships, including relationships with your friends, coworkers, romantic partners and family members. This allows you to take the steps necessary to calm this behavior when it is not necessary. 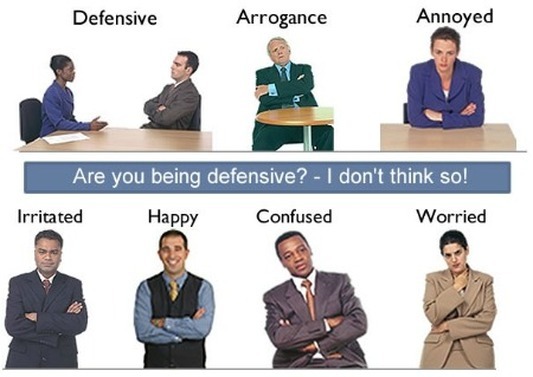 Defensive behaviors are hard-wired into your brain and they are not something that you learn. This type of behavior is characterized as getting defensive when you see something as a threat. While you still give attention to the situation at hand, you give more energy to defending yourself. When defensive behavior is allowed to continue without taking the steps to stop it, it becomes a destructive behavior. Those who are always on defense, for example, find it harder to succeed in their career, maintain lasting relationships and feel comfortable and calm. a) Passively: Those who are passively defensive tend to become withdrawn or quiet when they are on the defensive. b) Assertively: Those who are assertively defensive tend to express what they need and want, and establish clear boundaries. c) Aggressively: Those who are aggressively defensive blame others and are prone to physical and verbal attacks. a) Be honest about how you feel: If someone does something that hurts you, let them know. When you are honest about your feelings, you are allowing the other person to rectify their mistake so that you do not have to feel defensive. b) Protest and repair: If you are not happy about something, you should let this be known so that it can be fixed. This is a type of conflict that has a positive purpose because the other person may not know that their actions are upsetting you. When you protest their actions, you are making them aware so that they can take the necessary steps to fix the situation. c) Never stay silent: If you have something on your mind, you need to say it. Make sure that you say it in a manner that will not put the other person on the defensive. Learning to provide constructive criticism is important for this step because you need to be able to talk in a way that does not make the other person feel that they are unable to make the right changes. On the other hand, it is also important for you to be able to receive constructive criticism without becoming overly defensive. d) Do not withdraw from issues: When situations make people feel defensive, some people try to protect themselves by completely withdrawing from it. This does not address the root issue and it allows the problem to continue to grow. It is a risk to stay in a situation that makes you feel defensive, but it is an important risk to take. e) Improving yourself: How often and how severely you become defensive has a lot to do with you. Working on your self-esteem and how you react to things is important for preventing defensive behavior. Those who are confident are less likely to become defensive. Since everyone is prone to defensive behavior, it is important that you are mindful about it. The first step in taking control is to know that you do get defensive when you feel that an attack is occurring or is imminent. Use the information above to alleviate your tendency toward getting defensive. It takes time to change your behavior, so make sure that you are patient and that you take the time each day to work on your behavior. You are changing something that has been a part of you your entire life, so it will take time and effort.